A 5 out of 5 Sunbursts Rating by the Days Inn – Canada and located near Clifton Hill and the Falls is the Days Inn & Suites by the Falls. With 63 Rooms built in 2001 and 90 more rooms added in 2003, this Days Inn Hotel has been nominated at hotel of the year and offers a wide range of amenities. Located only a half block from the fun and excitement at Clifton Hill, and only a minutes from the Falls and the surrounding attractions, the Days Inn & Suites by the Falls is a great hotel for any type of traveler to Niagara Falls. Offering free parking and free continental breakfast, the 5 out of 5 Sunbursts by Days Inn – Canada Days Inn Hotel provides the perfect stay for any guest. 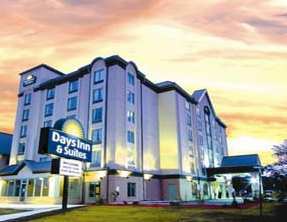 The Days Inn & Suites by the Falls offers guests a heated indoor pool, hot tub, free newspaper, wireless high speed Internet, and a fitness facility.